Highlights of new features launched at ZenHub over the month of May. New A new My Information section of the dashboard highlights what information we store about your user profile. 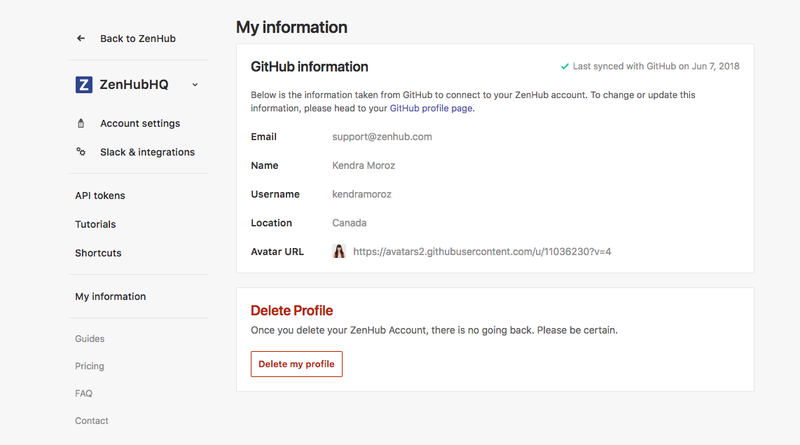 This includes a new option to delete your profile if you're no longer using ZenHub and wish to unsync your account. Bug fix The background color for weekends on the Burndown Chart are now darker for easy weekend identification. Bug fix When clicking Load more Issues on the Closed pipeline you'll now get feedback that Issues are loading. Bug fix When requesting a license, and an admin assigns one to you, the email you get sent to indicate you're now able to view your team Boards will properly lead you to ZenHub!